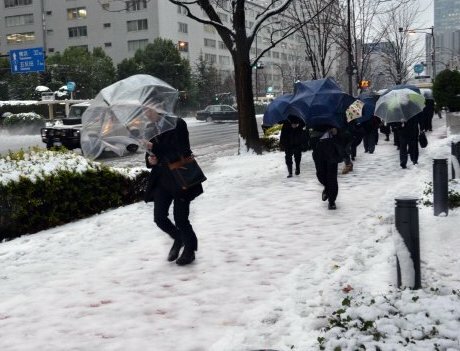 Tokyo, Jan 18: At least 169 people were injured as heavy snow hit eastern and northern Japan on Monday. Parts of Japan expressway were closed, flights cancelled and Shinkansen bullet train services were suspended due to the snow. Around 8,400 households suffered power blackout due to the snow, Xinhua reported. Japan’s weather agency said the snow was caused by a rapidly developing low pressure system, forecasting up to 80 cm of snow would fall in the Tohoku region and 60 cm in Hokkaido, Hokuriku and Tokai areas over the 24 hours through 6.00 a.m. (local time) Tuesday. Early commuters were trapped as traffic system was disrupted by the heavy snow. Shinkansen bullet train services and other trains operating in and around the Tokyo metropolitan area were delayed and some sections of expressway were closed. Local airlines said over 100 domestic flights were cancelled, mostly from and to Tokyo’s Haneda airport.